From their respective drug wars to the Abu Sayyaf which include Indonesians as their hostages, here are 5 things Philippine president Rodrigo Duterte and Indonesian president Joko Widodo are likely to talk about. 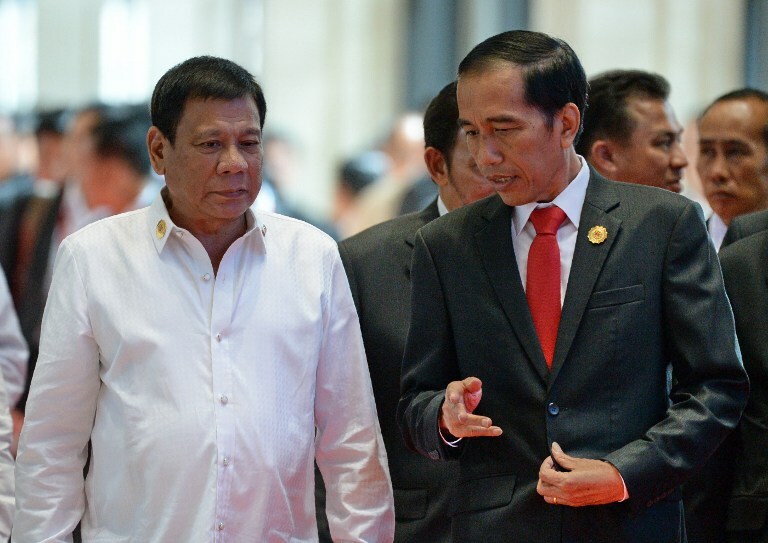 JAKARTA, Indonesia – Philippine President Rodrigo Duterte’s first state visit as head of state will be to Indonesia, where he is scheduled to meet with Indonesian President Joko “Jokowi” Widodo on Friday, September 9. Indonesia, with over 250 million people, is the 4th most populous country in the world and is the country with the world’s largest Muslim population. Historically, the two countries have had friendly relations, so it comes as no surprise that Indonesia is one of the Philippine president’s first foreign trips. The two leaders also share similar national issues, including a war against drugs that both countries are waging domestically. Rappler spoke to Professor Dewi Fortuna Anwar, who serves as Director for Program and Research at The Habibie Center, about what the two leaders are expected to discuss. Anwar is also the deputy secretary of the Vice President for Political affairs. There are currently 10 Indonesian hostages still under captive by the Abu Sayyaf, a terrorist group based in the Philippines, responsible for kidnappings for ransom and previous bomb attacks. In recent months, a string of abductions in seas between Indonesia and the Philippines have raised concerns, with Indonesia demanding the release of their nationals, and urging the Philippine government to do more. Anwar said that if the Philippines says it can rescue the hostages on their own, it is important to discuss "what steps will the Philippines take to ensure the hostages are all safe, because sometimes when you storm a stronghold, hostages can get caught in the crossfire.” Alternatively, if the Philippines accepts the offer of Indonesia to send security forces to rescue the hostages, then details must be ironed out. Indonesia has said it is ready to help if the Philippines agrees. “We are mindful, we are respectful and sensitive of the Philippines as a sovereign country,” Anwar said, adding it is important that there is an “official invite from the Philippine government” before Indonesia gets involved in rescue efforts. In relation to the string of maritime kidnappings, Anwar said the two leaders must also talk about how to best patrol Sulu Sea, where the Abu Sayyaf operate. 24 Indonesian crew members and a handful of Malaysians have been abducted this year travelling in the vital waterway between the 3 countries. In May, Indonesia, Malaysia and the Philippines agreed to launch coordinated patrols of the waters, which didn’t stop kidnappings at a later date. Duterte has ordered the military to “destroy” the Abu Sayyaf and has declared a state of national emergency on account of lawless violence in Mindanao. Both Jokowi and Duterte have claimed their respective countries are suffering from a drug crisis. Both administrations are waging a war on drugs domestically, but have faced criticism from the international community for their approaches. The leaders are expected to discuss their respective anti-narcotics campaigns. Jokowi is criticized for the executions of drug convicts and the use of the death penalty, while Duterte has been slammed for the increase of extrajudicial killings in the Philippines since his presidency, which are said to be related to his drug war. Duterte himself also said he would speak to Jokowi about the case of Mary Jane Veloso – a Filipina on death row in Indonesia for allegedly smuggling drugs into the country – and appeal her case. "Well, I may just have to ask Widodo in a most respectful and in very, very courteous way. And if my pleadings will fall on deaf ears, I am ready to accept it – for the simple reason I do not doubt the judicial system of Indonesia," Duterte said. Growing concerns about the aggressiveness of China in the region is also bound to be a topic of conversation between the two leaders, as it has been among ASEAN leaders. China claims nearly all of South China Sea, through which $5 trillion in shipping trade passes annually, even waters approaching the coasts of the Philippines and other Southeast Asian nations. A UN-backed tribunal ruled in July that China's claims to most of the sea had no legal basis, and its construction of artificial islands in waters claimed by the Philippines was illegal. Beijing vowed to ignore the ruling. “We’ve been very worried about seeming division within ASEAN which could actually lead to ASEAN being pitted against one another, being used as competing interests of superpowers,” she said, referring to the failure of ASEAN leaders to come up with a joint statement on the South China Sea last July. Four ASEAN members – Vietnam, the Philippines, Malaysia and Brunei – have competing claims with Beijing over parts of the South China Sea. Most members of the bloc want to keep pressure on China over its campaign of island building in the strategic waters but China has been accused of teasing poorer members like Laos and Cambodia into fracturing regional unity with promises of aid and trade. Anwar also said it is important for the countries to agree to uphold international law and to push for the creation of a Code of Conduct for the South China Sea. With both countries looking to develop their economies, the ASEAN economic community and further cooperation is also likely to be a topic of discussion. Anwar said this is a topic that should not just be discussed in ASEAN meetings but also on a bilateral level, as its success involves the government at all levels. “Indonesia and the Philippines should revive cooperation in Sulawesi, Kalimantan and Southern Philippines,” Anwar said. She said connectivity between these areas “should be given special attention,” which is in line with priority of developing the economy. The Philippine economy grew 7% in the second quarter of the year, making it the fastest growing economy in the region. The tail-end of the second quarter also saw President Rodrigo Duterte assume the presidency, with his economic team promising to retain the previous administration's macroeconomic policies.